Top: Lone Mesa State Park, July 9, 2008. Above and left: Canyon of the Ancients National Monument, May 13, 2016 and May 14, 2007. 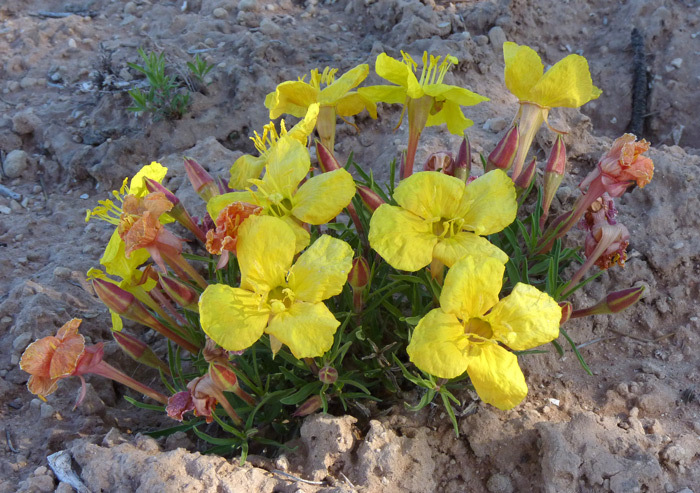 This member of the Evening Primrose Family differs from many other Oenotheras because it blooms during the day. The long trumpet-like flowers then dry to shades of pink-orange-rust by late afternoon. 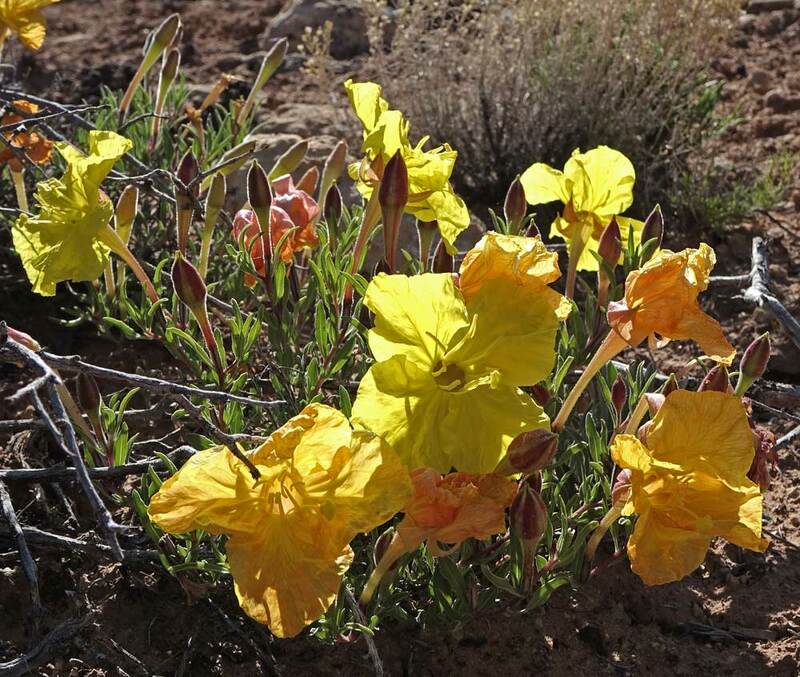 The fresh crinkly yellow petals and then the dried flowers are diagnostic characteristics of this species. Leaves are short and narrow with smooth edges. 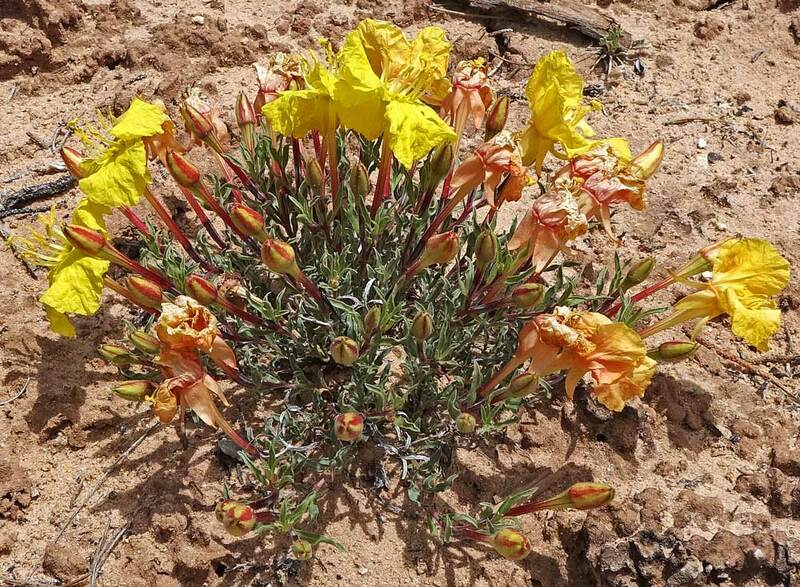 Linnaeus named the Oenothera genus in 1753 using a name given several thousand years ago by Theophrastus to another genus in this family. 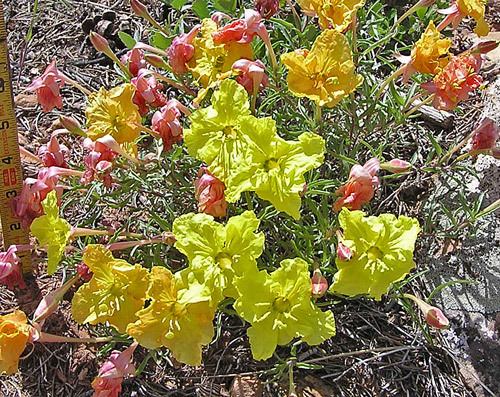 The meaning of "Oenothera" is not agreed on; Greek gives us both "oenos" for "wine" and "thera" which is variously translated as "to seek", "to imbibe", "to catch", "to hunt". "Thera" could indicate that the plant (really just the root) was used to flavor wine, or the root was used to absorb wine and was then fed to animals to calm them, or the juice of the root was put in wine to seduce, or the root in wine just plain made people happy. "Caly" is Greek for "calyx" and "lophus" is Greek for "a crest", both referring to a small projection from the sepals. "Lavandulifolia" refers to the lavender-like leaves. 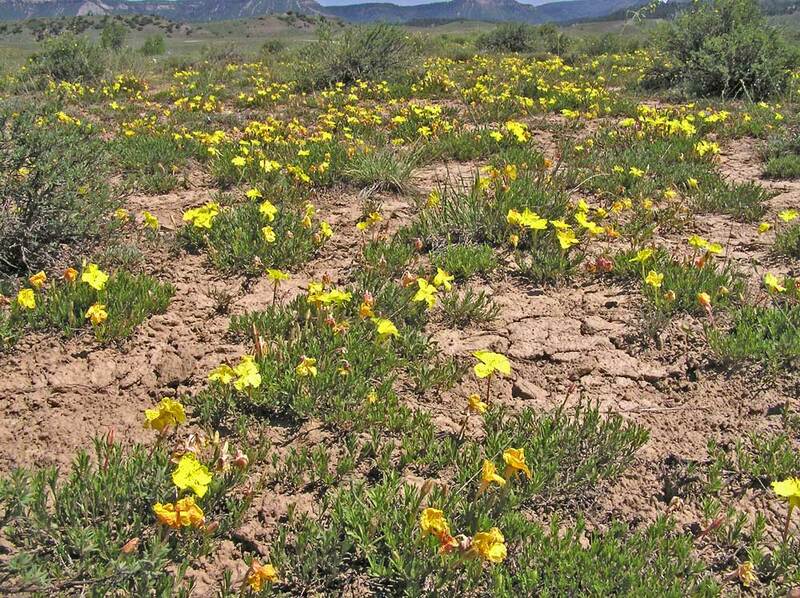 The first specimen of this plant was collected for science by Edwin James near the Platte River in Colorado in 1820 and the plant was named Oenothera lavandulifolia by Torrey and Gray in 1840; it was renamed Calylophus lavandulifolius by Peter Raven in 1964, but the original 1840 name is now accepted. Lone Mesa State Park, July 9, 2008. This is such an attractive plant, whether in isolated clusters or in magnificent displays over broad areas. Even the buds have their own special attractiveness.